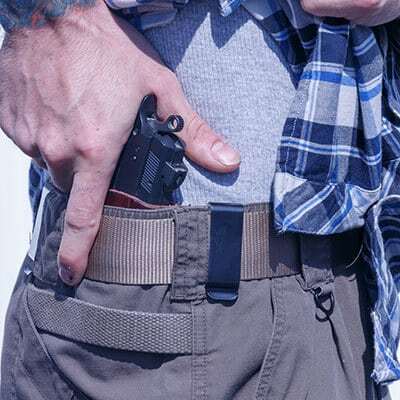 Backwater Guns & Outfitters offers the North Carolina Concealed Carry Weapons Course. Upon the successful completion on this class, you will have a good understanding of North Carolina firearms laws, and you will be able to apply for your concealed carry permit within the state of North Carolina. You will be given a certificate of completion for the course, so long as you pass both the course exam and the shooting proficiency test, immediately at the conclusion of the class, and this is what you need to take to your local sheriff’s office in order to apply for the permit itself. A thirty (30) round firing range shooting proficiency test will be given. You will be expected to hit 25 of 30 shots on the target, and the shooting will take place at 3 yards, 5 yards, and 7 yards of distance. You may use your own handgun, except for a derringer hand gun (we have found this gun to be difficult to hit the target with). Should you need a handgun to use, Backwater Guns does not charge a rental fee for the use of our handgun (either a 9 mm semi-automatic pistol or a 38 special revolver), but we do ask that you buy ammunition (30 rounds) from our store prior to the date of the class. Please come to the store to pay for the course and sign up by the day before the class date.